Mi Madre is an avid college basketball fan. It's almost insane. For instance, she wouldn't go to the hospital when she was in labor with Josh because of a basketball game. No lie. This quirk is magnified x10 during March Madness. She loses it. This has rubbed off on me. I don't follow all season like I should, but, I love following the insanity. I completely love that every game is down to the last few minutes. Despite my love for the season, this was my first year filling out a bracket. We did them at work on Scott's (the PA's) request. He said he wanted to 'smack talk' everyone when Duke won. Due to the totally unpredictable wins that have taken place, most of us are out. Sadly, Scott's bracket is standing strong. Needless to say, we are all hoping Duke loses... Nothing against Duke, it's just the 'smack talk' was no joke. Anyway, my madness carries over into my apartment. The games are usually on when I'm home. 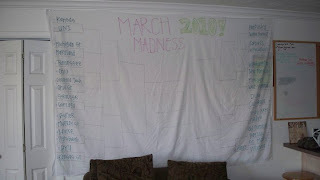 I even bribed Tanya that I would take her to the grocery store if she would draw me a bracket. Little did she know what she was getting into. Hey, at least I let her start it after the first round of games!